This summer, the Everest Blog will be featuring some EC alumni who have recently graduated from college. Mikayla Thibodeau graduated from Grand Valley State University in Grand Rapids, Michigan, on April 30 of this year. The 2012 Everest alum received her degree in Hospitality and Tourism Management with an emphasis on event planning. 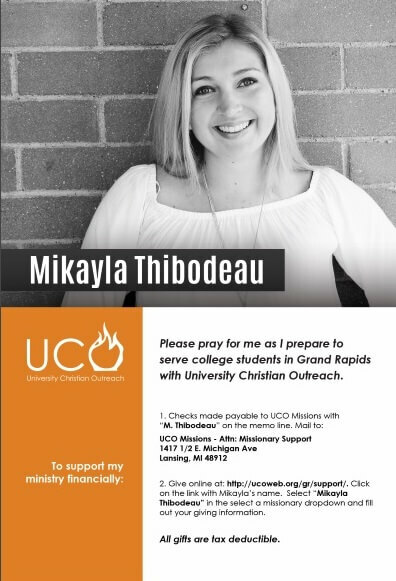 During her time at Grand Valley, Mikayla became involved with an ecumenical Christian group called University Christian Outreach (UCO) whose purpose is to help bring together and unify Christians on campus. About 50 students are involved in the organization at Grand Valley, and UCO also has groups at other universities like Michigan and Michigan State. Though she said she was formed well in her Catholic faith at Everest, she had never really had her faith challenged like she did at UCO meetings. So Mikayla began to develop a habit of more personal prayer time. She also began reading Scripture and started a weekly Eucharistic Adoration hour on Thursdays. “I need a place of quiet to pull me from the world,” she said. The UCO group at Grand Valley had a staff of about 10 young adults who helped organize the meetings, and eventually Mikayla said she felt called to become one of them. As of the start of the 2016-2017 school year, Mikayla will join the Grand Valley UCO staff as a campus missionary. She will be working with the freshman and sophomore girls, leading their small group discussions and prayer group meetings. She said her experience at Everest as a Challenge team leader, as well as participating in Mission Youth Missions like going to Haiti, helped her develop her skills as a mentor, which she will be using in her UCO work. This summer, Mikayla is fundraising for her missionary “salary” for the upcoming year. So far, she is about 1/3 of the way to her goal. 1417 ½ E. Michigan Ave.